I’ve got a exception that says ‘.. contains unsupported pointcut primitive get’, any solution to this error? 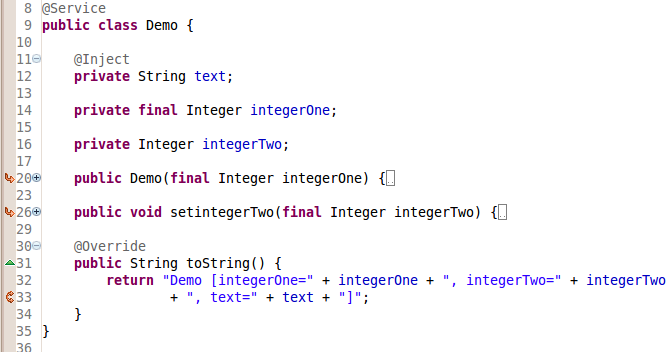 Are you using Spring AOP with AspectJ syntax? Spring AOP doesn’t support field pointcuts. If you’re weaving with AspectJ, post your aspect on stackoverflow.com and tag it with aspectj and I will take a look at it. I just copied your codes and tried to run it, however, I found I got that exception. So I wonder how did you manage to compile them. I am new to aspectj. I use the AJDT Eclipse plugin . Then you can just: right click on your project –> Configure –> Convert to AspectJ project. This enables compile-time weaving and tool support like this image illustrates.